I bought a Flir camera for my iPhone. Right around $120 or so. Pretty cool. Even $1500 is a bargain for a good FLIR. The shop I work for has one of these babies. Link? Are you happy with it? I've been waiting for them to get to the $100 range but cautious of quality/reliability issues. I don't need one. Well, *everybody* needs one, but you know..
Well it’s certainly not like their professional models! But I’m pretty impressed. I had no reason to get one either but when I saw the good reviews and the price I thought what the hell. When I first got it I was just scanning the room and noticed that it was showing purple all around the front door. Huh. Sure as hell, really cold air coming in all around there! Fixed that right up with some weather stripping. Negatives? It looses battery fast if it’s in storage. I keep it on a charger now all the time. It also uses up the battery pretty fast while it’s on. Not a huge deal as it’s not like it will be used for long periods. Oh. It’s USB C for charging. It comes with a cable, but if you’re like me you don’t have any USB C cables so don’t lose it!!! Here’s a pretty good example of how sensitive it is. I stood on the floor (hardwood) there for maybe 5 seconds, backed up and snapped the pic. I also got one of these some weeks ago. $35. Connects via WiFi to your phone. I got it because something was in my garbage disposal and I couldn’t find it. Endoscope for the win!! I connected it to my iPad and looked in there and found a tiny piece of metal that I was able to get. it comes with a magnet a hook and a mirror too. I think at this price it’s a must have. Super handy!! Where did you get it? Everything I've seen is $200 & up. I looked it up. My bad. It was $160 at the time I got it in December Just checked now and it’s $200 !!! Thanks. That's what I thought it might be, but was hoping for an unseen good deal somewhere. Most of the cost is in the sensor itself and optics, with higher end optics being made of germanium, while some are made of specific plastics. The smaller units for cell phones, while limited (don't look at the sun or your campfire with it) and much lower in performance, are still quite handy for general snooping around and importantly enables a larger audience to get a first hand look at what thermal imaging is all about. Yeah, it is Predator cool (warm? ), but the uses seem to be never ending. 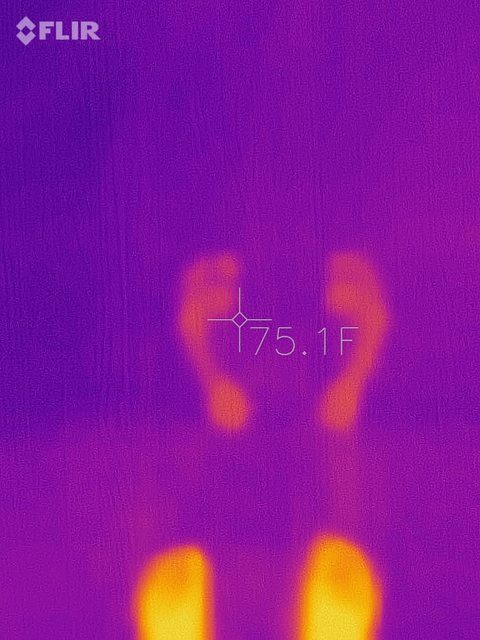 Being able to visualize thermal gradients in real time on a variety of targets is fantastic. * Excellent way to quickly analyze an HVAC/AC refrigerant system for operation. * Electrical hotspots, failing breakers, bearings on electrical motors. * Inside the house it is very easy to see drafty windows and doors, as well as trace roof leaks (the water line is very visible). * Externally, with a decent resolution imager, you can see where water builds up under a roof. * One cylinder on your FZ not firing? A quick visual will show which it is. When thermal imaging was my primary job, the question always came up, "How far can it see? ", to which my tongue-in-cheek answer was, "Well, the sun is 93 million miles away and....". In reality, many imagers are spec'd as to how far away a specific target is detectable, such as a human or vehicle. We have to keep checks on hand because there are some businesses that won't accept cards. Like our local License Center where we have to renew our car tabs, licenses, etc. They only accept checks, no cards. There are also some local mom and pop restaurants that don't accept cards that we like to go to. Holy 20th century Batman! We renew car tags at a kiosk inside the local Kroger. 5 minutes and 4 cars and 2 motorcycles, done. I hate checks, didn't have them or need them for several years, but the last couple years there's been a handful of instances. County offices for pemits is one. Stupid. Still have docs that only take cash or check. And places that that charge a convenience fee for my preferred form of payment get a check, utilities, etc. But, I can let the bank bill pay generate the check and cover the postage. MN license system is all screwed up, switched to a new system over a year ago and the thing didn't work from the get go...spending millions trying to fix it now. My kid had to get his 60 day learner permit re-stamped twice because they couldn't process it for his actual card. So what should have taken a couple weeks took over 6 months. It's just dumb!!!! Haven't used a personal check in at least 15 years. I have used cashiers checks to purchase / pay deposits on high ticket items like bikes and property and such.